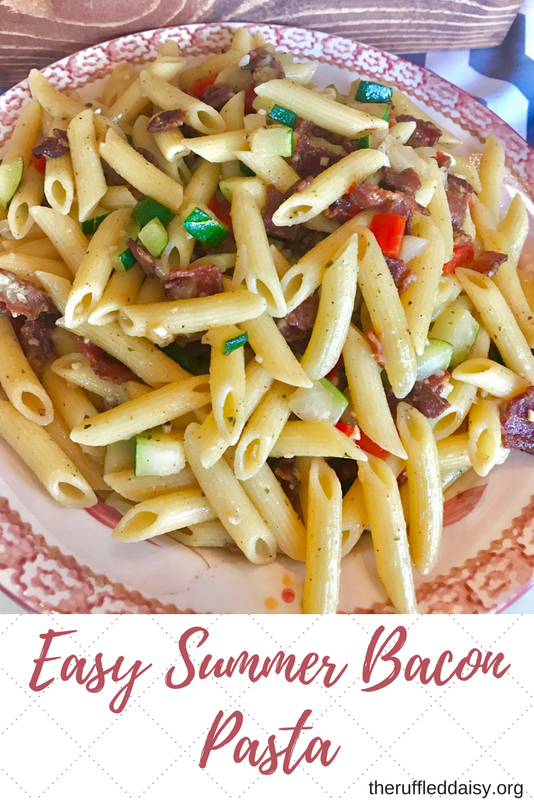 Having a dish like this Easy Summer Bacon Pasta to make during the long hot days makes cooking dinner and pleasing your family so easy! And it has bacon – that makes everyone happy doesn’t it?! We are a family that has boys that play ALOT of competitive baseball and once March hits, I really don’t know what day it is pretty much through July! It’s intense and makes dinnertime so challenging! This recipe is perfect because it’s quick and EASY! 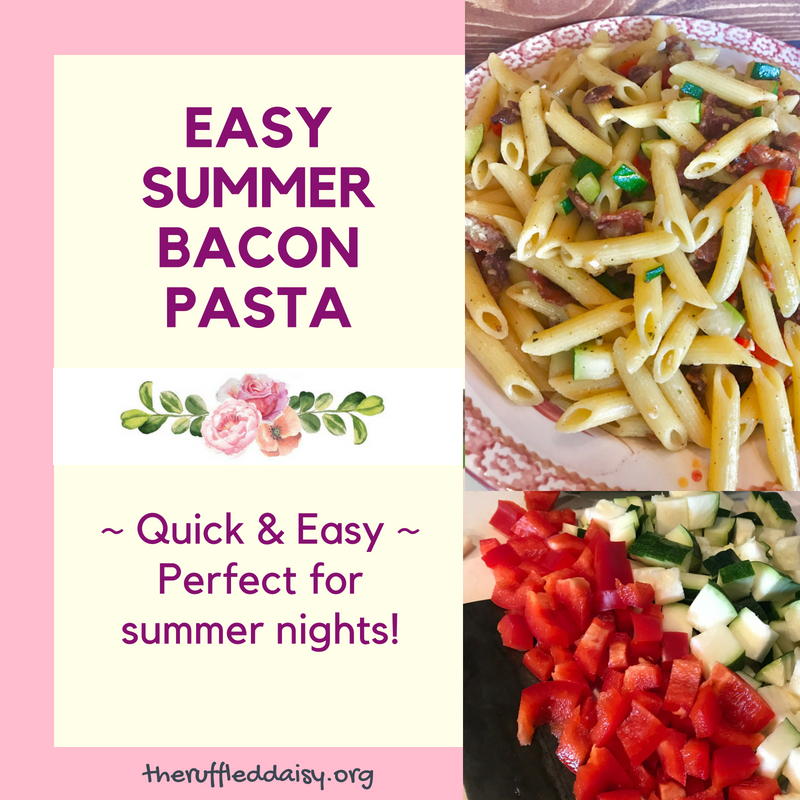 Here’s how to make your own Easy Summer Bacon Pasta! Cook your pasta as you’re creating the rest of the dish. 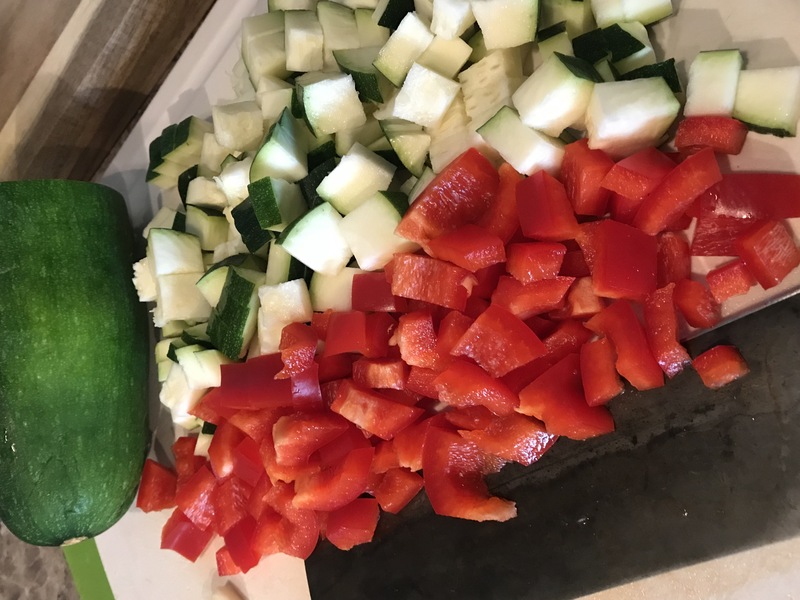 With fresh summer veggies in abundance right now, this is the perfect dish to use up some zucchini, onion and red pepper! Dice them up and saute them in the leftover bacon grease. Add garlic when almost done. 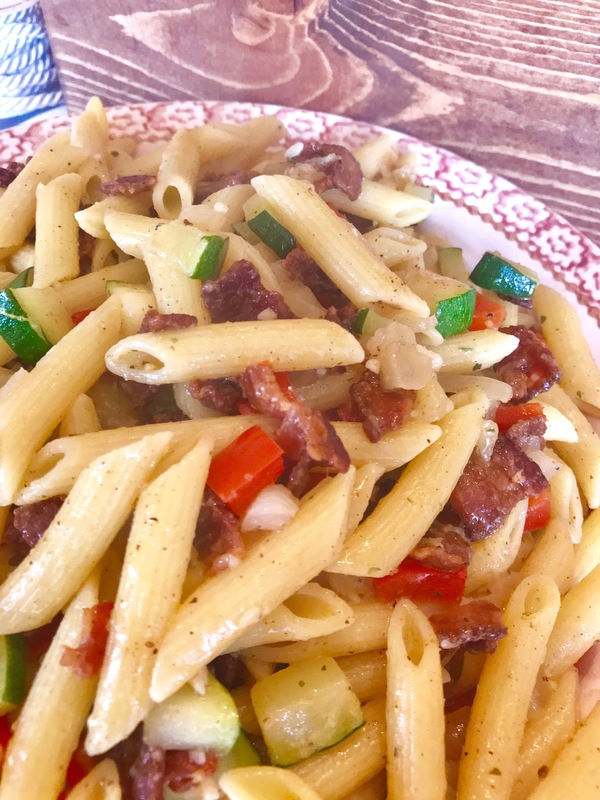 Salt and pepper to taste and mix in your pasta and bacon pieces! Look at that amazing yumminess! Guess what?! That’s it! You’re DONE!!!! What is a dish that is your go-to during busy summer nights? 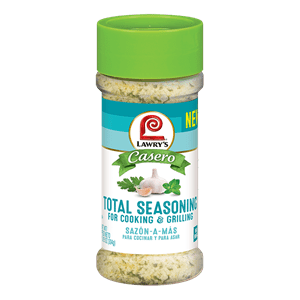 Do you like trying new dishes or do you have a family favorite that you’ve been making for years? Make sure you PIN this to your Pinterest boards so you can always find it! Or you can follow me on Pinterest HERE and always be able to find it! I LOVE having new followers. Fry bacon and dice when cool. Reserve 1 tablespoon grease. Saute veggies in 1 tablespoon of bacon grease. 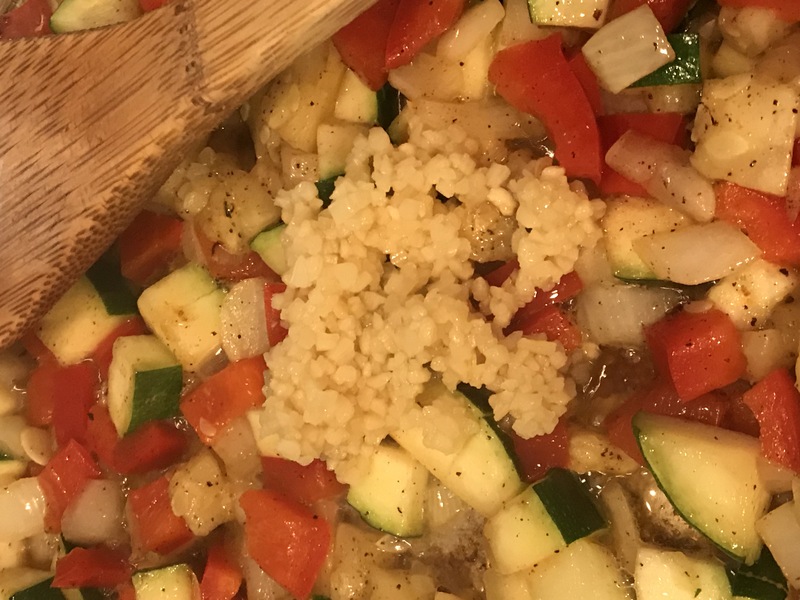 Add garlic to veggies when almost done. Toss with pasta and bacon to incorporate. 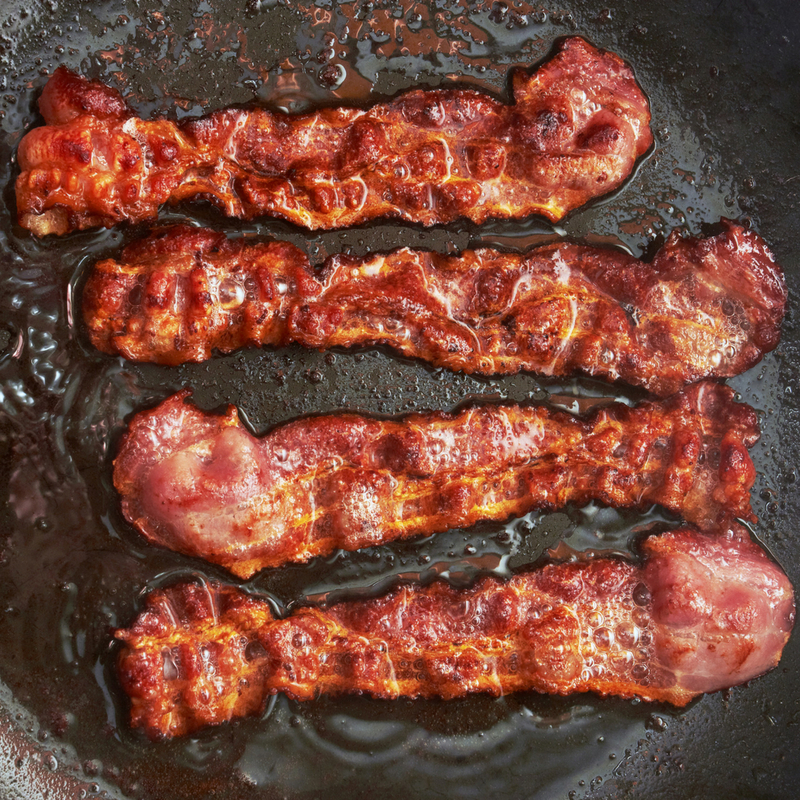 Taht bacon looks delicious! Such a yummy recipe! 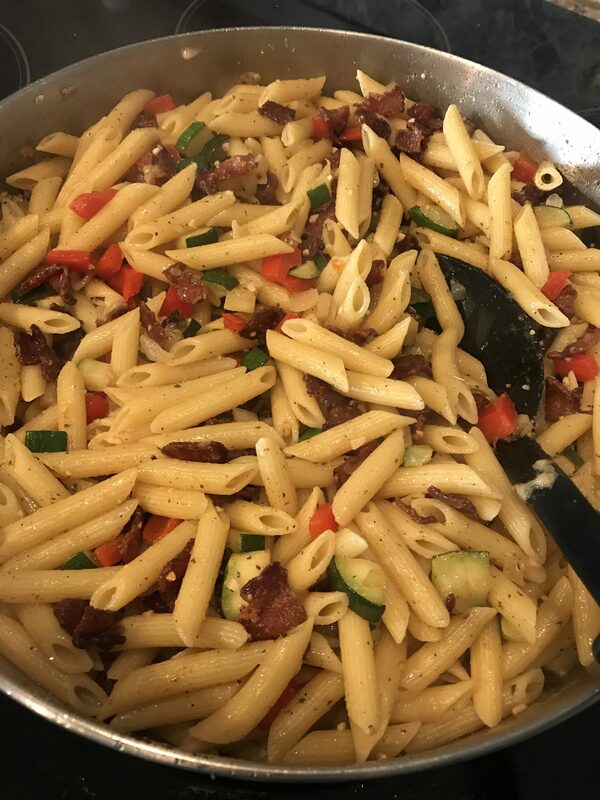 Bacon pasta?! Yes please. I can’t wait to try this one out. Oh my goodness! I love all the ingredients in this recipe! Sounds delicious! This sounds so tasty! Pinning it to have for dinner ideas!